The Frankfurt Investment Arbitration Moot Court is organized by the Wilhelm Merton Centre for European Integration and International Economic Order, Frankfurt and is hosted by the Frankfurt International Arbitration Centre. The moot is one of the few international student competitions focusing solely on investment protection, which is presently the most innovative and intellectually challenging branch of international law with high practical relevance. 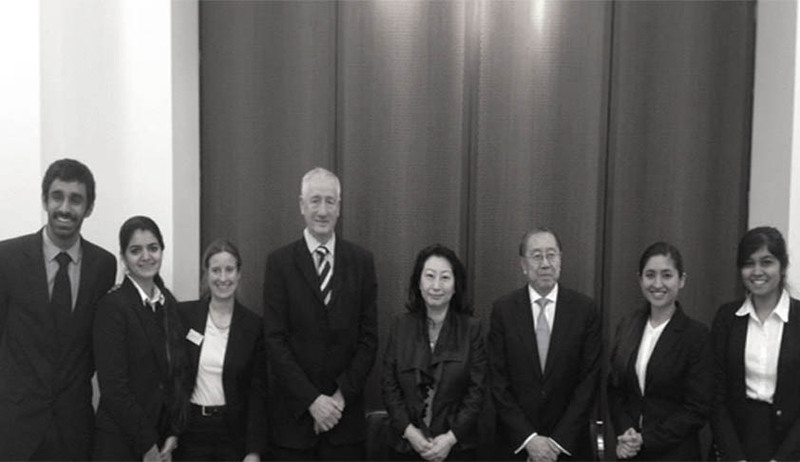 ARBITRATION MOOT hosted by the University of Frankfurt am Main, Germany. Professor Rudolf Dolzer, Teresa Weng and Mr. Christopher Lau were the judges in the final round of the competition. The Team has won a scholarship for a three-week placement at The Hague Academy of International Law and 1500 Euros in their position as the THE BEST ASIAN TEAM. In addition, Mallika Singh also won the BEST ADVOCATE OF THE FINALS and was awarded The McDermott Will & Emery Scholarship for pursuing the LL.M. programme in International and Comparative Dispute Settlement at Queen Mary School of International Arbitration (London). The team has achieved this distinction after facing National Law University, Delhi at the Semi-Finals and Singapore Management University at the Finals of the competition. The team had previously qualified to the world rounds after their distinguished performance at the Regional Rounds of the competition, where they faced some of the law schools from across the country. Congratulations for such a big achievement!! LiveLaw : How do you feel after such a big achievement? Kanika Mishra : Relieved! Mooting is like a big gamble. You invest all your energy and time into something you are not even sure will give you the results that you have worked for. A achievement is nothing but something which reassures me that if you believe in something and work hard towards it, then luck will come along. LiveLaw : What was your motivation behind opting for the reason behind doing this moot? Why did you decide to do this moot? Kanika Mishra : In law school at least, I try and have liked working with my friends, not that I mind working with others or can’t work with others. But the sole reason being that the feeling to achieve something with a friend doubles the value of the experience, and this is something I can afford to do in law school only. One of my close friends, Madhav Rangrass, wanted to do this moot and I liked the subject matter. Obviously, the more important reason was that I felt that it was a great opportunity. LiveLaw : What difference did you find in Frankfurt Investment Arbitration Moot Court as compared to other National and international Moot Court Competitions? Kanika Mishra : I have done two National Moot before that and I feel the biggest differences are 1stThe level of the moot problem, which is far challenging from national moots 2nd The level of organization and 3rd Which the biggest actually, that’s the level of judges. International Moot Court Competition have some phenomenal people judging students, which actually gives them an opportunity to further learn even more. LiveLaw : What is the most important thing you learnt while preparing and competing this competing this moot? Kanika Mishra : While Preparing: To deal with pressure, and most importantly how fight against your personal conflicts and try and try as hard as you can to set your professional priorities right. While Competing: To be alert all the time and constantly evolve and improve yourself, I always believe that the work during the moot is of very high importance. LiveLaw : What was the toughest part while preparing and mooting? Kanika Mishra : International Moots are of a very long period. You live with one problem for months, so for me at least, the roughest part was to keep calm and hold on to yourself, your work and your believes, even when nobody else believes in you. LiveLaw : Did any one of you feel like giving up at any point of time? If yes, how didyou guys motivate each other? Kanika Mishra : Yes, multiple times. At times you feel like that every day. You cry and whine a lot, at least I did. But I had certain people, outside the mooting world, who didn’t understand why I was so worked up, they held me up by thinking of it be a easy deal. Your family and friends really help you to hold up, specially because they know that its important for you. LiveLaw : How did you guys come up with such a fantastic team? Kanika Mishra : I have actually never thought about that. It just happened. But I guess great things just happen. LiveLaw : What pattern did you guys adopt for your preparation? How did you guys divide your work? Kanika Mishra : Honestly, that was the only thing we did without any hassle. Everyone was willing to work on every issue and help each other out. And one very big thing, there is never a pattern while preparing for moots. LiveLaw : How much contribution would you like to attribute to your professor/ college over this achievement? Kanika Mishra : A lot! From getting us books that we needed, to ensuring our visa’s and tickets were done. The university, the administration and professors were of great help. LiveLaw : How many National and International Moot Competition have you guys participated in and won? Kanika Mishra : The 1st Moot was 4th NLSIU Juris Corp National Corporate Moot Court Competition, where we finished as runners up. The 2nd was 4th NLSIU R.K Tankha Moot Court Competition, where we finished as semi-finalist and also won best memorial. And yeah, with FIAMC I finish my 3rd moot. LiveLaw : What area of law would you guys like to gain expertise in? Has this moot changed your mind set regarding the area you would like to gain expertise in? Kanika Mishra : It surely has made me got interested in investment arbitration as a subject to study. But I am not sure if I can say one subject that I am extremely sure about at the moment. Maybe, law school is the place to be confused, to read and think about everything and just hope that something will strike up soon! LiveLaw : How did you balance your academic performance or internship with the preparation of the moot? Kanika Mishra : I don’t know the right words to describe how the balance can be achieved. All I would say is that it’s hard, but not impossible. Just work towards everything and don’t give up. Someone once told that if you think you have an option to slag in one of the aspect then you surely can’t achieve the balance or achieve what you have desired. So, maybe the balance can come when you tell yourself that there is no second option and this is it. Kanika Mishra : Enjoy anything and everything I do. I am sure if Corporate law will be the life, I surely enjoy that and I think that is what is coming my way at the moment, a law firm, but hopefully the right thing will come, I am sure I will finally reach the happy and satisfied point that I have in mind. Kanika Mishra : Best of the team: Everyone wanted to win! As I said, when you believe and work with the same goal, things work a long. Roadblocks: I am not sure if this can out rightly said to be a roadblocks, but all of us worked very differently. Hence, it was always difficult to understand the other person’s style of working. But this is normal when we moot. Differences of opinion, differences in working style are all normal hassles attached to a team preparing for a moot. The 1st aspect that I mentioned, the main aim just trumps everything. Kanika Mishra : We had 7 rounds in total. For me at least, I think every team was brilliant. But the Semi finals against NLU Delhi and the Finals with SMU were the two memorable rounds. They were great its always good to see great competition and above that perform well too. LiveLaw : What do you think got you success in the finals? Kanika Mishra : Being alert, being focused, and definitely our belief in each other and ourselves. LiveLaw : What message would you like to pass onto the mooters and the non- mootersout there? What is your advice to someone who has never mooted before? Kanika Mishra : To Non-mooters: This is an experience, worth having so always try it once at least! Give this a chance to experiment and learn. Never ever in such a short period one can know about a subject matter in a manner like the way one does while mooting. Also, mooting is not the world, but it teaches you things such as professionalism and hard work, which are attributes one needs to adopt in their life. Mooting teaches one to take a risk and work harder to fight against luck and other attributes,which are not in our hands. One key message to mooters will be to believe in each other and yourself; nothing can be done alone to try working with your team. So, work hard, believe in yourself, believe in your team, and stay strong, because in the end mooting is not the only thing in life. We thank you for your timeand wish you all the very best for all your future endeavour ! !